Today was the low-key launch of the new “bread-and-butter” plane of Airbus. The exterior of the aircraft was a simple “Airbus A320-200”, and unless you know your aircraft – and your engines – you might miss the real innovation – the new Pratt and Whitney Geared Turbo Fan engines. These much bigger engines are supposed to save at least 15 per cent on fuel consumption and are much quieter, two valuable attributes for airlines – and airports – today. This A320neo is the newest iteration of one world’s most popular passenger aircraft. The A320 was the world’s first fly-by-wire aircraft when it premiered in 1988 with Air France and almost 6,900 have been built. Airbus’ order books are bursting with further nearly 4,500 orders of around 80 customers for the A320neo family. So the commercial premiere of the A320neo is quite significant for the airline, the manufacturer and the traveling public. None of this was showing today, Monday January 25, 2016, at Frankfurt airport, however. 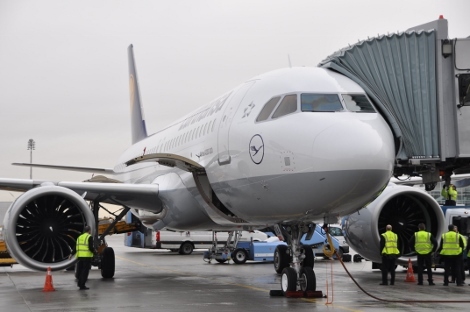 Unlike most new aircraft, the first A320neo for Lufthansa, registered D-AINA, had been delivered from the Hamburg factory on Friday without any ceremony or acknowledgement. The commercial world premiere was supposed to happen yesterday, Sunday, on a flight from Frankfurt to Hamburg, but was cancelled due to “valve problems” with the new engines, as a Lufthansa spokeswoman commented. So the first commercial flight finally happened on flight LH100 from Frankfurt to Munich on Monday. There was no ceremony, no signage or speeches acknowledging the event. The only reference to this world premiere was the captain’s announcement over the PA.
Of most interest to Business Traveller readers is the interior, however. The fact is that as reported here, the A320neo in Lufthansa’s new configuration carries 180 passengers, 12 seats (or two seat rows) more than the current A320s of the carrier, which physically have the same fuselage dimensions. There are five rows with more pitch. 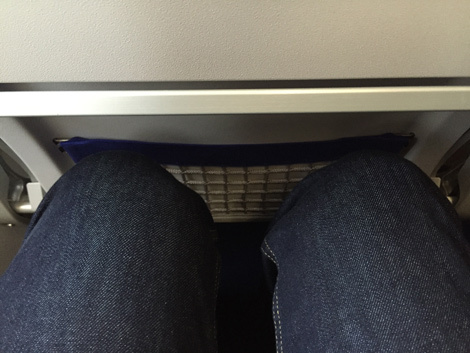 Lufthansa says the pitch is 81cm for these business class rows. The total number of rows is 30, the average pitch in Economy is 29 inches (74cm), but the last three rows have just 28 inches (71cm). Swiss meanwhile, already flies the A320 with 186 seats. It’s clear that these legacy carriers want to copy the high density of the low-cost carriers while still maintaining some attributes of full-service carriers. Lufthansa for example still serves free soft drinks and a small snack to economy passengers even of the lowest fare classes. And seat-wise, the Germans still offer a slight recline and leather seats. But never has the distinction between premium seats in business class and others in economy been as clear as in the new Lufthansa A320neo cabin. Lufthansa claims it has gained space by rearranging toilets and galleys, but it has also squeezed seat pitch considerably in the rows after about the first third of the cabin. 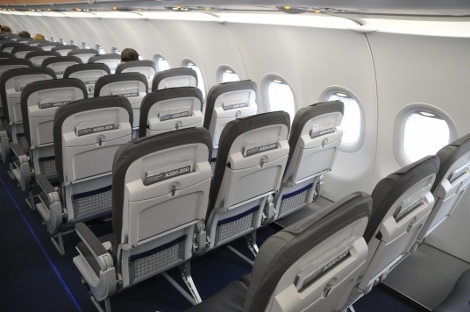 This author did his own measurements today: On a current Lufthansa A320, there are 11.8 inches (30cm) of space between the back of the Recaro slimline seat in front and the edge of the next seat. The space to sit on, measured from the edge to the beginning of the backrest, is 16.9 inches (43cm). Compare this to economy seats in the new A320neo: Here the foot- and legspace measures just 28.5cm, the seat itself offers only 41cm. The recline, especially of the window seats on the premiere aircraft was not well-oiled yet and a bit hard to apply, other seats were easier to recline, although the actual recline is minimal. 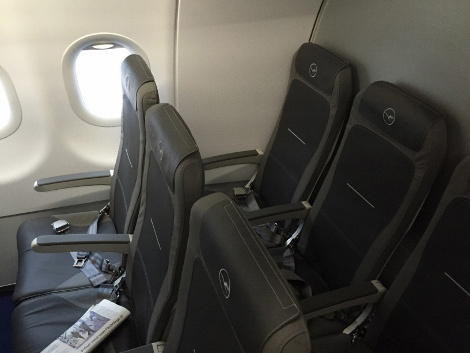 Official seat pitch in Lufthansa’s Economy on the A320neo is 29.1 inches (71cm). But in all fairness it has to be said that for the author, measuring 1.88m in height and often flying low-cost carriers and otherwise long haul business class, the space was adequate for a short flight like the premiere from Frankfurt to Munich, taking 35 minutes in the air. Subjectively, it felt more comfortable than seating on easyJet. How it performs on longer sectors remains to be seen. The big difference is in business class. Unlike carriers such as British Airways, the divide between business class and economy class has been reinstated. In the first (about) six rows, with a guaranteed free middle seat, the leg space measures a comfortable 36cm, while the seat itself from edge to back offers 42cm of space, so even in business class one centimetre less than before. Officially the seat pitch in business is 31.8 inches (81cm). At the back of the aircraft in economy, the last row has no windows (see below), while there is now only one lavatory, which has been squeezed in front of the rear bulkhead wall, taking half of the fuselage diameter, with the other half taken by a now much smaller galley. The last row, row 30 (there is no row 13). The average pitch in Economy is 29 inches (74cm), but the last three rows have just 28 inches (71cm). Lufthansa group has 116 neo-type aircraft on order, 45 of them the larger A321neo. The first aircraft will mostly fly from the main base Frankfurt to both Munich and Hamburg – more deliveries are expected in mid-February.